July 1st - 6th (July 4th is a Holiday) - Harlem 1-Week Debate Institute. Click here for information. Click here to register. July 8th - 12th - Manhattan 1-Week Debate Institute @ Hunter College. Click here for information. Click here to register. July 8th - 19th - Manhattan 2-Week Debate Institute @ Hunter College. Click here for information. Click here to register. August 12th - 16th - Queens 1-Week Debate Institute @ Maspeth High School. Click here for information. Click here to register. August 12th - 23rd - Queens - 2-Week Debate Institute @ Maspeth High School. Click here for information. Click here to register. TBA - Bronx 1-Week Debate Institute (TBA). Click here for information. Click here to register. July 8th - 12th - Manhattan 1-Week Debate Institute @ Silberman College Click here for information. Click here to register. July 8th - 19th - Manhattan 2-Week Debate Institute @ Silberman College. Click here for information. Click here to register. Welcome to New York City Debate Summer Camp 2019! Join us this Summer and become a great debater! From those who have never participated in debate to varsity high school debaters – join us for our Summer Debate Institutes! Students at all skill levels learn public speaking, refutation, questioning, research, writing, reading, listening and other academic skills. But most of all – it is fun! Debate games, tournaments, activities, raffles, games and more! What makes us the best summer debate institute? The NYC Urban Debate League is the nation's largest and most successful debate league in the nation. Click here to view our national awards! 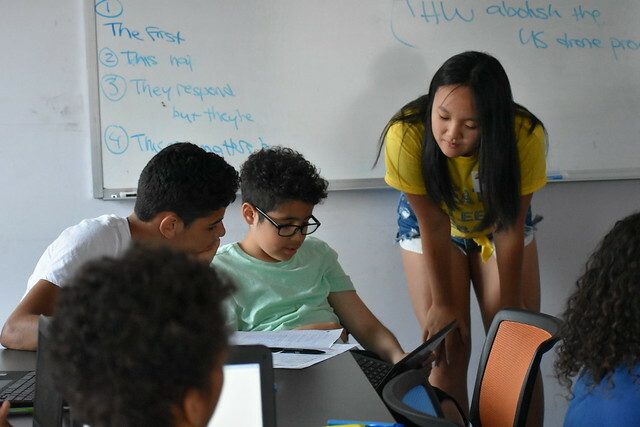 But what is most unique about our summer program is that we are the only nonprofit summer program in NYC where all proceeds go back to NYC students and schools. There are many debate camps that are operated by for profit companies. But the NYC Debate League is for NYC students and NYC schools. All proceeds go to scholarships for NYC youth so that all students have the opportunity to attend summer debate camp. Our camps are taught by the best NYC debate coaches and teachers. The passion each of our staff members has for our mission drives each institute to be the best it can be. And its not just for the summer - the majority of our students return for our regular school year debate programming which is available to all summer students. And so we are the only summer debate institute that is also year round! So thank you for supporting the first and only Summer Debate Institute for New York City and by New York City. Tuition Information: Tuition varies based on when you sign up and whether you are choosing a one week or two week institutes. Please register early as prices increase the longer you wait! But please register early to take advantage of discounts. Some students may qualify for scholarships - ask your debate coach for more information. Scholarship recipients will be directed to apply their scholarship code in the check out process. Tuition includes: breakfast, lunch, snacks, debate handouts, texts, and instruction. Payment and Registration Information: You can select the camp(s) below for more details and you will be directed to a shopping cart where you can check out. Shortly upon payment you will receive by email a parent and student registration form that includes additional details (emergency contact information, medical, and other information to complete your registration). Tuition: Tuition covers breakfast, lunch, snacks, Camp T-Shirt, and debate materials. Some programs qualify for scholarships - ask your debate coach for more information. Refunds: All payments are non-refundable. Credit can be applied to another NYCUDL Debate Institute during the summer and/or provided up to 1 year from the date of the event for next summer's Debate Institutes. Location/Date Changes: Conveniently located throughout NYC at major colleges and high schools including Hunter College, Silberman Graduate School, IN-Tech Academy, the Harlem Education & Activities Fund, and Maspeth High School. Since we rely on the generosity of our host locations, we acknowledge that sometimes their needs will change regarding classroom availability, dates, etc. While we do our best to secure camp locations and dates, we cannot guarantee there will be no changes. If there are location or date changes, you will receive a full refund and/or exchange. Schedule: Unless otherwise noted, camps are Mondays-Fridays, 9:00am-3:00pm. The one exception is the high school school debate institute at the Silberman Graduate School which is closed on Fridays. Curriculum: Our interactive curriculum makes public speaking and debate engaging and fun for all ages. Though our curriculum varies slightly depending upon the debate format (Parliamentary, Public Forum, Policy), some skills we cover cross-curriculum include public speaking, debate, speech writing, researching, questioning, and more. Each week of each institute culminates in a camp-wide tournament that also cultivates debaters' competitive skills and prepares them for upcoming debate seasons. Digital Debate Summer School: our new feature this summer is an online digital debate course available for all summer students with extra resources for learning about public speaking and debate. The course includes readings, videos, games and more! Additionally, there is an online Public Forum Debate Digital Classroom for the September/October public forum topic! Grade Levels: Our camps are open to 5th-12th graders. Rising students (8th graders going into high school and 5th graders going into middle school) are encouraged to apply to their grade level next school year since they have the opportunity to compete next year in their grade level. For example, a current 8th grade student should apply to our high school debate institutes. Questions? Please contact us at erik@debate.nyc or (917) 455-1079 if you have any additional questions. To sign up for a summer debate institute, click here! Wanna see pictures of past summer institutes? Visit our Facebook page or our Flickr!